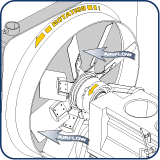 The rotation direction (CW, CCW) is determined by looking in the direction of the airflow. 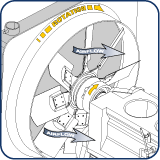 The description (Sucker, Blower) is determined how the fan forces air through the radiator. 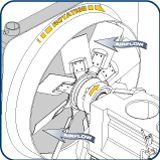 Is there an engine or other obstruction immediately downstream (in the exhaust/discharge) of the fan? 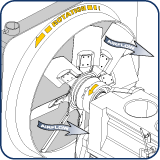 If the application is similar to the images below, select With Engine Silhouette. This End User License Agreement (this “Agreement”) is a binding agreement between Horton Holding, Inc. (“Licensor”) and you as a corporation or other legal entity conducting business primarily as an Original Equipment Manufacturer (“OEM”) as the licensee of the Software (“Licensee” or “You”). LICENSOR PROVIDES THE SOFTWARE SOLELY ON THE TERMS AND CONDITIONS SET FORTH IN THIS AGREEMENT AND ON THE CONDITION THAT LICENSEE ACCEPTS AND COMPLIES WITH THE TERMS AND CONDITIONS HEREUNDER. BY CLICKING THE “ I ACCEPT” BUTTON YOU (A) ACCEPT THIS AGREEMENT AND AGREE THAT LICENSEE IS LEGALLY BOUND BY ITS TERMS; AND (B) REPRESENT AND WARRANT THAT: (I) LICENSEE IS A CORPORATION OR OTHER LEGAL ENTITY AND IS A BUSINESS CUSTOMER (OR POTENTIAL BUSINESS CUSTOMER) OF LICENSOR (AND LICENSEE IS UNDER NO CIRCUMSTANCE A CONSUMER OR INDIVIDUAL); AND (III) THE PERSON EXECUTING THIS AGREEMENT ON BEHALF OF LICENSEE IS AN INDIVIDUAL 18 YEARS OF AGE OR OLDER WITH THE RIGHT, POWER AND AUTHORITY TO ENTER INTO AND BIND LICENSEE TO ITS TERMS. IF LICENSEE DOES NOT AGREE TO THE TERMS OF THIS AGREEMENT, LICENSOR WILL NOT AND DOES NOT LICENSE THE SOFTWARE TO LICENSEE AND YOU MUST NOT DIRECTLY OR INDIRECTLY DOWNLOAD, INSTALL AND/OR IN ANY WAY USE THE SOFTWARE. NOTWITHSTANDING ANYTHING TO THE CONTRARY IN THIS AGREEMENT AND/OR LICENSEE’S ACCEPTANCE OF THE TERMS AND CONDITIONS OF THIS AGREEMENT, NO LICENSE AND/OR ANY OTHER RIGHT IS GRANTED (WHETHER EXPRESSLY, BY IMPLICATION OR OTHERWISE) UNDER THIS AGREEMENT, AND THIS AGREEMENT EXPRESSLY EXCLUDES ANY RIGHT, CONCERNING ANY SOFTWARE THAT LICENSEE DID NOT ACQUIRE LAWFULLY OR THAT IS NOT A LEGITIMATE, AUTHORIZED COPY OF LICENSOR’S SOFTWARE. “Authorized Users” means the following individual persons who are employees of Licensee that have been authorized by Licensee to use the Software pursuant to the license granted under this Agreement. “Licensee Input” means data or information which is proprietary to Licensee and entered as inputs into the Software in connection with use of the Software in the ordinary course of use of the Software. “Software” means the software programs designed to enable Licensor OEM business customers to input their specific OEM product specification requirements in order to facilitate discussions between such OEM business customers and Licensor’s sales and marketing team members in order to identify potentially available Licensor products that may match the OEM business customers’ specific OEM component requirements. (a) Download and install one (1) copy of the Software on one (1) computer owned or leased, and controlled by, Licensee. Each such computer shall be for a single Authorized User. (b) Use and run the Software as properly installed in accordance with this Agreement and solely for Licensee’s internal business purposes relating solely to using products of Licensor as a component part of Licensee’s OEM goods and/or OEM products. Such use is permitted only on the computer on which the Software is installed, at the physical location thereof and not via any remote access or other network. (k) use the Software for purposes of competitive analysis of the Software, the development of a competing software product or service or any other purpose that is to the Licensor’s commercial disadvantage.
. Licensee is responsible and liable for all uses of the Software through access thereto provided by Licensee, directly or indirectly. Specifically, and without limiting the generality of the foregoing, Licensee is responsible and liable for all actions and failures to take required actions with respect to the Software by its Authorized Users or by any other Person to whom Licensee or an Authorized User may provide access to or use of the Software, whether such access or use is permitted by or in violation of this Agreement. (a) The Software contains technological copy protection or other security features designed to prevent unauthorized use of the Software, including features to protect against any use of the Software that is prohibited under this Agreement, in addition to content display features designed to determine and control the content viewable by Licensee based on information Licensee hereby agrees to make available to Licensor regarding Licensee’s use of and inputs into the Software including Licensee Input. Licensee shall not, and shall not attempt to, remove, disable, circumvent or otherwise create or implement any workaround to, any such copy protection, security or content display features. (i) Licensee shall immediately remedy such noncompliance and provide Licensor with written notice thereof. Licensee shall provide Licensor with all access and assistance as Licensor requests to further evaluate and remedy such noncompliance. (ii) If Licensee’s use of the Software exceeds the number of copies or Authorized Users permitted under the license, Licensor shall have the remedies set forth in Section 5(d). (c) During the Term, Licensor may, in Licensor’s sole discretion, audit Licensee’s use of the Software to ensure Licensee’s compliance with this Agreement. Licensor also may, in its sole discretion, audit Licensee’s systems within five (5) years after the end of the Term to ensure Licensee has ceased use of the Software and removed the all copies of the Software from such systems as required hereunder. The Licensee shall cooperate with Licensor’s personnel conducting such audits and provide all reasonable access requested by the Licensor to records, systems, equipment, information and personnel, including machine IDs, serial numbers and related information. (d) If any of the measures taken or implemented under this Agreement results in a determination by Licensor in its sole discretion that the Licensee’s use of the Software exceeds or exceeded the use permitted by this Agreement then Licensor may terminate this Agreement upon notice to Licensee. Licensor’s remedies set forth in this Section 5(d) are cumulative and are in addition to, and not in lieu of, all other remedies the Licensor may have at law or in equity, whether under this Agreement or otherwise. (v) verifying Licensee’s compliance with the terms of this Agreement and enforcing the Licensor’s rights, including all Intellectual Property Rights in and to the Software. (b) Licensee grants Licensor, its licensors and subcontractors a non-exclusive, perpetual, irrevocable, assignable, transferable, sublicensable, worldwide license to use, access, copy, store, transmit and display Licensee Input for the purposes of (a) providing and improving the Software, (b) preventing or addressing service or technical problems, (c) responding to Licensee’s requests in connection with any Licensee support matters that Licensor in its sole discretion may decide to participate in or responded to, (d) enforcing this Agreement, or (e) complying with applicable laws and regulations.
. Licensee acknowledges and agrees that the Software is provided under license, and not sold, to Licensee. Licensee does not acquire any ownership interest in the Software under this Agreement or any other rights thereto other than to use the same in accordance with the license granted, and subject to all terms, conditions and restrictions, under this Agreement. Licensor and its licensors and service Licensors reserve and shall retain their entire right, title and interest in and to the Software and all Intellectual Property Rights arising out of or relating to the Software including information or data regarding usage or performance of the Software and the results of Licensee’s use of the Software including any specific potential product configurations and product designs that may result from or be generated by Licensee’s use of the Software including through the entering of Licensee Input into the Software, except as expressly granted to the Licensee in this Agreement. Licensee shall safeguard all Software (including all copies thereof) from infringement, misappropriation, theft, misuse or unauthorized access. Licensee shall promptly notify Licensor if Licensee becomes aware of any infringement of the Licensor’s Intellectual Property Rights in the Software and fully cooperate with Licensor in any legal action taken by Licensor to enforce its Intellectual Property Rights. (b) Licensee may terminate this Agreement by ceasing to use and destroying all copies of the Software. (c) Licensor may terminate this Agreement, effective upon written notice to Licensee, if Licensee breaches this Agreement. (d) Licensor may terminate this Agreement, effective immediately, if Licensee files, or has filed against it, a petition for voluntary or involuntary bankruptcy or pursuant to any other insolvency law, makes or seeks to make a general assignment for the benefit of its creditors or applies for, or consents to, the appointment of a trustee, receiver or custodian for a substantial part of its property. (e) Upon expiration or earlier termination of this Agreement, the license granted hereunder shall also terminate, and Licensee shall cease using and destroy all copies of the Software. THE SOFTWARE AND ANY DOCUMENTATION ARE PROVIDED TO LICENSEE “AS IS” AND WITH ALL FAULTS AND DEFECTS WITHOUT WARRANTY OF ANY KIND. TO THE MAXIMUM EXTENT PERMITTED UNDER APPLICABLE LAW, LICENSOR, ON ITS OWN BEHALF AND ON BEHALF OF ITS AFFILIATES AND ITS AND THEIR RESPECTIVE LICENSORS AND SERVICE LICENSORS, EXPRESSLY DISCLAIMS ALL WARRANTIES, WHETHER EXPRESS, IMPLIED, STATUTORY OR OTHERWISE, WITH RESPECT TO THE SOFTWARE AND ANY DOCUMENTATION, INCLUDING ALL IMPLIED WARRANTIES OF MERCHANTABILITY, FITNESS FOR A PARTICULAR PURPOSE, TITLE AND NON-INFRINGEMENT, AND WARRANTIES THAT MAY ARISE OUT OF COURSE OF DEALING, COURSE OF PERFORMANCE, USAGE OR TRADE PRACTICE. WITHOUT LIMITATION OF THE FOREGOING, THE LICENSOR PROVIDES NO WARRANTY OR UNDERTAKING, AND MAKES NO REPRESENTATION OF ANY KIND, THAT THE LICENSED SOFTWARE WILL MEET ANY OF THE LICENSEE’S REQUIREMENTS, ACHIEVE ANY INTENDED RESULT, BE COMPATIBLE OR WORK WITH ANY OTHER SOFTWARE, APPLICATIONS, SYSTEM OR SERVICE, OPERATE WITHOUT INTERRUPTION, MEET ANY PERFORMANCE OR RELIABILITY STANDARD OR BE ERROR FREE OR THAT ANY ERROR OR DEFECT CAN OR WILL BE CORRECTED. LICENSEE AGREES THAT IN ORDER TO COMPLETE AND FINALIZE THE PURCHASE OF ANY POTENTIAL PRODUCT selections THAT MAY BE GENERATED THROUGH LICENSEE’S USE OF the Software, FOLLOWING USE OF LICENSEE OF THE SOFTWARE LICENSEE MUST CONTACT A LICENSOR DESIGNATED SALES REPRESENTATIVE TO DISCUSS LICENSEE’S PRODUCT NEEDS AND REQUESTS TO CONFIRM LICENSOR’S ABILITY TO DESIGN, MANUFACTURE, SUPPLY, MARKET AND/OR SELL POTENTIALLY APPLICABLE PRODUCT TO LICENSEE; LICENSEE AGREES THAT LICENSOR MAY NOT BE ABLE TO DESIGN, MANUFACTURE, SUPPLY, MARKET AND/OR SELL ANY PRODUCT TO LICENSOR FOLLOWING LICENSEE’S USE OF THE SOFTWARE INCLUDING REGARDLESS OF THE RESULTS OF ANY USE BY LICENSEE OF THE SOFTWARE AND/OR LICENSEE INPUT SHARED BY LICENSEE TO LICENSOR. (a) IN NO EVENT WILL LICENSOR OR ITS AFFILIATES, OR ANY OF ITS OR THEIR RESPECTIVE LICENSORS OR SERVICE LICENSORS, BE LIABLE TO LICENSEE OR ANY THIRD PARTY FOR ANY USE, INTERRUPTION, DELAY OR INABILITY TO USE THE SOFTWARE, LOST REVENUES OR PROFITS, DELAYS, INTERRUPTION OR LOSS OF SERVICES, BUSINESS OR GOODWILL, LOSS OR CORRUPTION OF DATA, LOSS RESULTING FROM SYSTEM OR SYSTEM SERVICE FAILURE, MALFUNCTION OR SHUTDOWN, FAILURE TO ACCURATELY TRANSFER, READ OR TRANSMIT INFORMATION, FAILURE TO UPDATE OR PROVIDE CORRECT INFORMATION, SYSTEM INCOMPATIBILITY OR PROVISION OF INCORRECT COMPATIBILITY INFORMATION OR BREACHES IN SYSTEM SECURITY, OR FOR ANY CONSEQUENTIAL, INCIDENTAL, INDIRECT, EXEMPLARY, SPECIAL OR PUNITIVE DAMAGES, WHETHER ARISING OUT OF OR IN CONNECTION WITH THIS AGREEMENT, BREACH OF CONTRACT, TORT (INCLUDING NEGLIGENCE) OR OTHERWISE, REGARDLESS OF WHETHER SUCH DAMAGES WERE FORESEEABLE AND WHETHER OR NOT THE LICENSOR WAS ADVISED OF THE POSSIBILITY OF SUCH DAMAGES. (b) IN NO EVENT WILL LICENSOR’S AND ITS AFFILIATES’, INCLUDING ANY OF ITS OR THEIR RESPECTIVE LICENSORS’ AND SERVICE LICENSORS’, COLLECTIVE AGGREGATE LIABILITY UNDER OR IN CONNECTION WITH THIS AGREEMENTOR ITS SUBJECT MATTER, UNDER ANY LEGAL OR EQUITABLE THEORY, INCLUDING BREACH OF CONTRACT, TORT (INCLUDING NEGLIGENCE), STRICT LIABILITY AND OTHERWISE, EXCEED THE TOTAL AMOUNT PAID TO THE LICENSOR PURSUANT TO THIS AGREEMENT FOR THE SOFTWARE. (c) THE LIMITATIONS SET FORTH IN Section 10(a) AND Section 10(b) SHALL APPLY EVEN IF THE LICENSEE’S REMEDIES UNDER THIS AGREEMENT FAIL OF THEIR ESSENTIAL PURPOSE.
. The Software may be subject to US export control laws, including the US Export Administration Act and its associated regulations. The Licensee shall not, directly or indirectly, export, re-export or release the Software to, or make the Software accessible from, any jurisdiction or country to which export, re-export or release is prohibited by law, rule or regulation. The Licensee shall comply with all applicable federal laws, regulations and rules, and complete all required undertakings (including obtaining any necessary export license or other governmental approval), prior to exporting, re-exporting, releasing or otherwise making the Software available outside the US.
. The Software is commercial computer software, as such term is defined in 48 C.F.R. §2.101. Accordingly, if the Licensee is the US Government or any contractor therefor, Licensee shall receive only those rights with respect to the Software as are granted to all other end users under license, in accordance with (a) 48 C.F.R. §227.7201 through 48 C.F.R. §227.7204, with respect to the Department of Defense and their contractors, or (b) 48 C.F.R. §12.212, with respect to all other US Government licensees and their contractors. (a) This Agreement is governed by and construed in accordance with the internal laws of the State of Minnesota without giving effect to any choice or conflict of law provision or rule that would require or permit the application of the laws of any jurisdiction other than those of the State of Minnesota. Any legal suit, action or proceeding arising out of or related to this Agreement or the licenses granted hereunder shall be instituted exclusively in the federal courts of the United States or the courts of the State of Minnesota in each case located in Minneapolis, and each party irrevocably submits to the exclusive jurisdiction of such courts in any such suit, action or proceeding. Service of process, summons, notice or other document by mail to such party’s address set forth herein shall be effective service of process for any suit, action or other proceeding brought in any such court. (c) All notices, requests, consents, claims, demands, waivers and other communications hereunder shall be in writing and shall be deemed to have been given: (a) when delivered by hand (with written confirmation of receipt); (b) when received by the addressee if sent by a nationally recognized overnight courier (receipt requested); (c) on the date sent by facsimile or e-mail (with confirmation of transmission) if sent during normal business hours of the recipient, and on the next business day if sent after normal business hours of the recipient; or (d) on the third day after the date mailed, by certified or registered mail, return receipt requested, postage prepaid. .
(e) Licensee shall not assign or otherwise transfer any of its rights, or delegate or otherwise transfer any of its obligations or performance, under this Agreement, in each case whether voluntarily, involuntarily, by operation of law or otherwise, without Licensor’s prior written consent, which consent Licensor may give or withhold in its sole discretion. For purposes of the preceding sentence, and without limiting its generality, any merger, consolidation or reorganization involving Licensee (regardless of whether Licensee is a surviving or disappearing entity) will be deemed to be a transfer of rights, obligations or performance under this Agreement for which Licensor’s prior written consent is required. No delegation or other transfer will relieve Licensee of any of its obligations or performance under this Agreement. Any purported assignment, delegation or transfer in violation of this Section 13(e) is void. Licensor may freely assign or otherwise transfer all or any of its rights, or delegate or otherwise transfer all or any of its obligations or performance, under this Agreement without Licensee’s consent. This Agreement is binding upon and inures to the benefit of the parties hereto and their respective permitted successors and assigns. (g) This Agreement may only be amended, modified or supplemented by an agreement in writing signed by each party hereto. No waiver by any party of any of the provisions hereof shall be effective unless explicitly set forth in writing and signed by the party so waiving. Except as otherwise set forth in this Agreement, no failure to exercise, or delay in exercising, any right, remedy, power or privilege arising from this Agreement shall operate or be construed as a waiver thereof; nor shall any single or partial exercise of any right, remedy, power or privilege hereunder preclude any other or further exercise thereof or the exercise of any other right, remedy, power or privilege. (i) For purposes of this Agreement, (a) the words “include,” “includes” and “including” shall be deemed to be followed by the words “without limitation”; (b) the word “or” is not exclusive; and (c) the words “herein,” “hereof,” “hereby,” “hereto” and “hereunder” refer to this Agreement as a whole. Unless the context otherwise requires, references herein: (x) to Sections and Exhibits refer to the Sections of, and Exhibits attached to, this Agreement; (y) to an agreement, instrument or other document means such agreement, instrument or other document as amended, supplemented and modified from time to time to the extent permitted by the provisions thereof and (z) to a statute means such statute as amended from time to time and includes any successor legislation thereto and any regulations promulgated thereunder. This Agreement shall be construed without regard to any presumption or rule requiring construction or interpretation against the party drafting an instrument or causing any instrument to be drafted. (j) The headings in this Agreement are for reference only and do not affect the interpretation of this Agreement. Welcome to the new Horton eRev web product selector. Thanks for visiting. As you are an unregistered user, you are only able to select the MS8 product range and won't be able to access tailored user configurations or project system features, nor be able to print full feature product information. To get full access to all of our products and the full features, please register for an eRev account. © 2019 - Horton Inc. All rights reserved.